I recently bought the Blu-Ray version of Forbidden Planet, which contained some art cards. If you have this version, look at the cards; in one there's a photo of Anne Francis's character, Alta, with Robbie the robot and two members of the crew, but it's not Anne Francis! Her hair—and legs!—are totally different, so who is this and why is she in the movie? I think that is Anne Francis, but she does not look right in that picture because the image was seemingly created from a black-and-white still that was ineptly colored. Notice that the colors on the uniforms are totally wrong. Compare the buff in the lobby card to the correct blue-gray (where I selected an image manifestly taken from a viewing of the film). Although he is seen mostly from behind, the leftmost individual in the lobby card photo certainly appears to be Leslie Nielsen. Anne Francis's most notable feature was probably her unusual eyes (eyes that served her well in her Twilight Zone appearances), which the woman in the picture has. What makes her look wrong is the poor job done on coloring her hair, and to a lesser extend shading her face. For reference, here is another black-and-white picture of Francis wearing the same costume as in the lobby card picture. 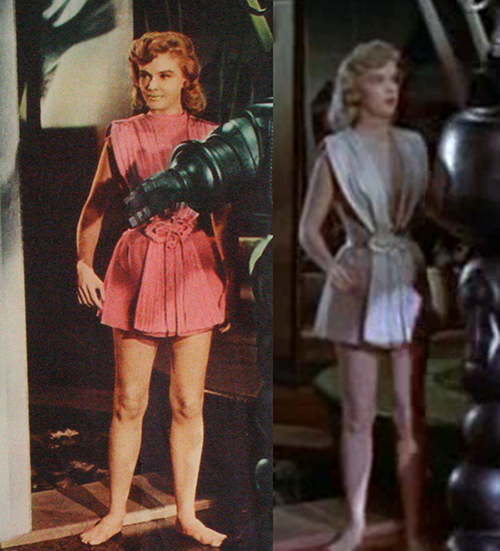 The costume appears totally different in its proper hues, but those look like the same legs to me. Whilst colourized for 1950's movie posters, the image is of Anne Francis on set, in costume and in a scene about an hour and 18 minutes into the movie. The angle is slightly different than the movie camera so is likely taken by and on-set photographer. As I can't match the excact poses of the actors, it is most likely from a different take or from a rehearsal immediately before rolling camera. This comparison shot shows the best full length capture of Anne in that scene. Not the answer you're looking for? Browse other questions tagged actor-identification forbidden-planet or ask your own question. 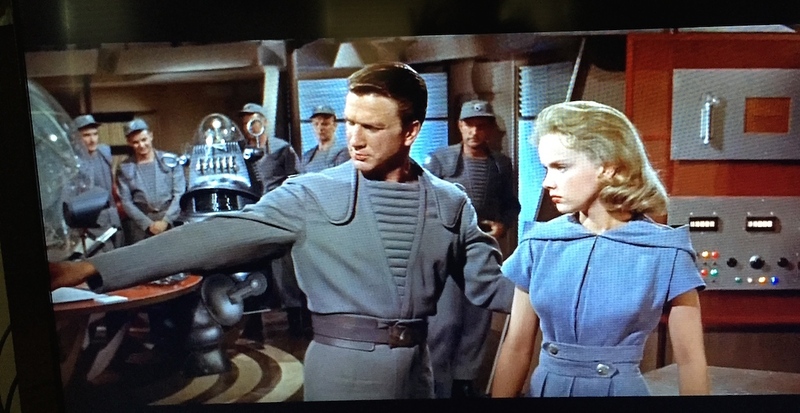 What is the name of this sci fi actor? Who is the FIRST First Doctor? Who are the MCU directors, producers, and actors in this photo?